I survived the 11 year old's party and the pack of marauding boys playing guerrilla games in the garden to lurch into this mass display or Adulation and Nostalgia. I am not a great fan of Air Supply's music - it reminds me too much of angst ridden Teenage years and swelling chorus lines that somehow embed themselves deep in the psyche. I cannot fault their performance though. For two nights they captivated the 2000+ audience and totally held them in thrall. 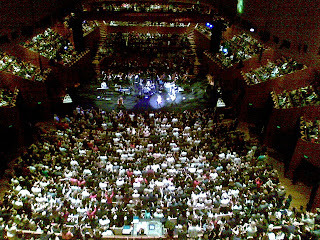 The two 80's icons gambolled, skipped and posed around the stage and auditorium of the Concert Hall and, despite being accused of having " the faint aroma of Mother's Day music" around them, they gave the audience what they wanted. There was a mosh pit full of arm-waving devotees and a chance to grab a hug or a quick snog as the two stars ventured into the stalls amongst their adoring fans. Russell Hitchcock and Graham Russell seemed pleasantly surprised that the entire audience knew all the words to all of their songs but they should have known better. This was their homeland and they were the local heroes with their easy listening lyrics and repetitious musical phrases. All of this smooching aside it was a very busy show for me because of the last minute change as baby-sitting the house lights turned into "make the Strand board a Whole Hog so the LD can work her magic". Luckily we had the rare luxury of a six hours of plotting time the day before so I programmed the Concert Hall 500 from its standard static orchestral states into a flashing, pulsing, moving light control console. I knew it could do it and I knew I could do it. I must admit it was a lot of fun rising to the challenge and on the final curtain everyone was happy; 2000 baby boomers, the idolised performers, the LD (who admitted to being a knitter and crocheter!) and me. Yay you! Well done! Congratulations! You must have been exhausted after all that - hope you got some worthwhile recuperation [knitting] time!